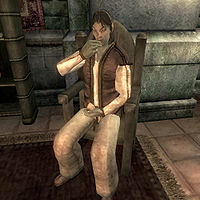 Othrelos is a Dunmer agent residing in the northeast section of the Elven Gardens District in the Imperial City. Othrelos is an advanced trainer in Sneak, claiming there is no law against it. He is also a member of the Thieves Guild and during The Ultimate Heist, your last rendezvous with the Gray Fox takes place in Othrelos' house. He lives most of his life in the company of his "friend", advanced Security trainer Mandil, who owns a key to Othrelos' house and will come visit every so often. Othrelos never sleeps, but spends all his nights, from midnight to 6am, wandering around on the ground floor with Mandil and will, on all days but Loredas, continue this wandering until 1pm when he finally leaves his house. At this time, he travels to the Market District for a bit of browsing in the Gilded Carafe. He leaves the store at 5pm and returns home in time for his dinner, which he will take between 6pm and 8pm. The rest of the evening is spent with Mandil on the ground floor. On Loredas, he will be on the ground floor until 10am, when he travels to the Arboretum for a breath of fresh air and relaxation. He returns to his house and his usual schedule at 5pm. During The Ultimate Heist, Othrelos waits patiently outside his house when you and the Gray Fox conduct your secret meeting in private. On the 7th of each month, when the clock strikes midnight, Othrelos lights up his torch and starts his long journey towards Skingrad. He crosses the Talos Bridge and heads south on the Red Ring Road, before finally hitting the Gold Road for the rest of the trip. He arrives in Skingrad the next morning and checks in at the West Weald Inn just before noon. Here, he will mingle with the other regulars until 8pm, when he will take an evening stroll in the area near Glarthir's house. At 4am, he will return to the inn. At 8pm on the 8th, he will once again stroll around outside until midnight when he finally returns to the Imperial City and his usual routines. His services are always available except when he is eating or wandering around at night (between midnight and 6am). His unfortunate habit of locking the door means it can be difficult to reach him at home without breaking and entering. These are the times his house will be unlocked: Morndas-Fredas: 6am-8am; Loredas: 6am-10am, 5pm-6pm, 8pm-12am; Sundas: 6am-12pm, 5pm-6pm, 8pm-12am. During his monthly trip to Skingrad, up until his departure at midnight on the 9th, he will offer his services twenty-four hours a day. During his journey back, he will offer his services at the usual times, starting at 6am. Othrelos will use an iron dagger to defend himself if caught stealing. He sports average middle-class clothing in discreet nuances, a brown shirt with light brown linens and thick cowhide shoes. He carries his house key, his torch, and a leveled amount of gold. When first meeting him, he will introduce himself and profess the legality of his profession: "Othrelos. I'm a Sneak... Advanced Sneak, in fact. And I train Sneaks. No law against it." When asked about the Imperial City, he will claim he is above the law: "The Watch can't touch me. I'm careful, private-like. Don't like people following me. Sure, it makes some people nervous, seeing me sneak around. Too bad." As an advanced trainer, he can also trigger the Sneak Master Training quest. When your skill level reaches 70, speak to him and he will point you towards master trainer Marana Rian: "You want more training? Then you'll have to go to the best. Marana Rian, here in the Imperial City. She can help you better than I." During The Ultimate Heist, he will be standing outside his house and will tell you to head inside when you approach him: "The Gray Fox is waiting inside." If you enter conversation with him at this point, he will only say: "Get inside. The Gray Fox is not a patient man." He will then immediately end his conversation with you. The other residents of the Imperial City have noticed their sneaky neighbor. When asked about rumors they will say: "Othrelos is a sneaky one. Kind of makes you wonder what he's up to. ", "I understand that Othrelos isn't a bad man to talk to, if you need to learn how not to be seen. ", "Do you know Othrelos? I'd like to learn how he gets around without being seen." and "Have you seen Othrelos moving around? It's like he sometimes just disappears." Others may comment: "I heard that he stood in one place for hours, just to teach himself how to be sneakier. Sounds boring, but whatever works for you." Additionally, a few prominent Imperial City trainers will point you towards Othrelos. Irene Metrick will say: "To know the right things, you have to know the right people. Ida Vlinorman, Mandil, Samuel Bantien, and Othrelos are the right people." Dul gro-Shug will also recommend Othrelos: "You just have to know the right people. Look up Ida Vlinorman and Othrelos in the Elven Gardens. They're the right people." Othrelos was intended to play a role in the unfinished "Imperial Couriers" quest; at midday on the 15th of each month, as long as Wilbur is still alive, he will head to the Black Horse Courier office in the Market District and spend a brief amount of time there, before taking a stroll between the Green Emperor Way and The Elven Gardens District and going back to his usual routine at 4pm. Because the game engine calculates traveling times a bit differently, the above traveling times don't always hold true. If you wait for Othrelos in Skingrad, he will enter the West Weald Inn at 6am. Esta página foi modificada pela última vez à(s) 23h45min de 20 de dezembro de 2015.